Select a turkey that is plump and meaty with smooth, moist-looking skin. The skin should be creamy colored. The cut ends of the bones should be pink to red in color. If the turkey is frozen, thaw it either slowly in the refrigerator or in cold water or quickly in the microwave, following the manufacturer's directions. A turkey weighing 8 to 12 pounds will thaw in about 2 days in the refrigerator. A turkey weighing 20 to 24 pounds will thaw in about 5 days in the refrigerator. A whole turkey can be safely thawed in cold water. Leave the turkey in its original wrap, free from tears or holes. Place in cold water, allowing 30 minutes per pound for thawing, and change the water often. Remove the package of giblets (gizzard, heart and neck), if present, from the neck cavity of the turkey, and discard. Rinse the cavity, or inside of the turkey, with cool water; pat dry with paper towels. Rub the cavity of turkey lightly with salt if desired, but do not salt the cavity if you will be stuffing the turkey. Stuff the turkey just before roasting--not ahead of time. Fill the wishbone area (the neck) with stuffing first. Fasten the neck skin to the back of the turkey with a skewer. Fold the wings across the back so the tips are touching. Fill the body cavity lightly with stuffing; do not pack the stuffing because it will expand during roasting. Tuck the drumsticks under the band of skin at the tail, or tie or skewer the drumsticks to the tail. Place the turkey, breast side up, on a rack in a shallow roasting pan. Brush with melted butter or margarine. It is not necessary to add water or to cover the turkey. Insert ovenproof meat thermometer so tip is in thickest part of thigh and does not touch bone. Follow Timetable for approximate roasting time. Place a tent of aluminum foil loosely over the turkey when it begins to turn golden. When two-thirds done, cut the band or remove the skewer holding the drumsticks; this will allow the interior part of the thighs to cook through. 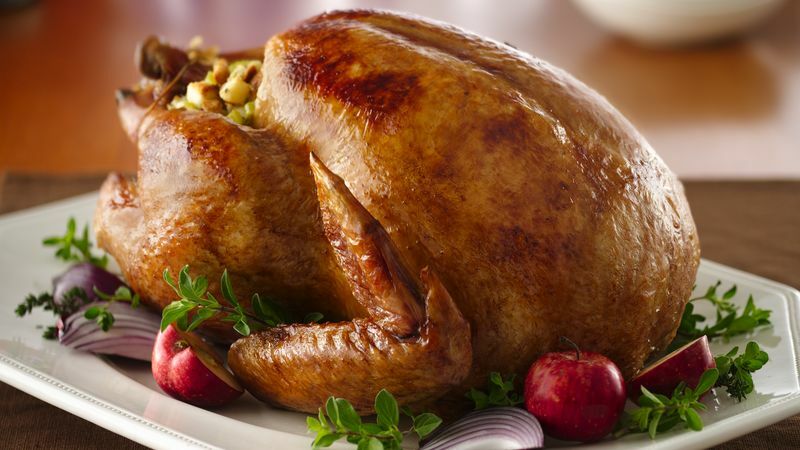 Roast until the thermometer reads 165°F (for a whole turkey) and drumsticks move easily when lifted or twisted. Thermometer inserted in center of stuffing should read165°F. When the turkey is done, remove it from the oven and let it stand for 15 minutes for easiest carving. Keep turkey covered with aluminum foil so it will stay warm. Roasting a turkey is a smart way to cook once and eat many times. Use leftover meat in sandwiches, stir-fries, salads, casseroles, soups and anything else you can think of! See Timetable for Roasting Poultry for exact roasting times. The timetable is based on chilled or completely thawed turkeys at a temperature of about 40ºF and placed in preheated ovens. Differences in the shape and tenderness of individual turkeys can require increasing or decreasing the roasting time slightly. For prestuffed turkeys, follow package directions very carefully; do not use the timetable.